What makes a movie script get spotlighted as best screenplay by award-giving bodies? When writing a campaign script, one has to take note of the campaign’s main objective. Whether you are to gather factual information for a lead generation campaign, to book a prospect for an appointment setting campaign, or register attendees for an upcoming event, your script must contain keywords and substantial ideas that would stir up the prospect’s interest, otherwise you’ll be putting all call efforts into waste. Increase sales effectiveness and generate warm and qualified sales leads with B2B Telemarketing Services. The purpose of the call is the key to grab the prospect’s attention. “I’m calling about a new software that could lessen manpower but multiply production at a lower cost” – position a benefit so that you could get hold of the prospect’s interest to discuss further. An appointment setting campaign’s objective is to activate the prospect’s interest to know more about the product or service, and agree for an office or phone meeting for a more detailed discussion. Criteria is set to qualify the prospect’s interest by asking probing questions. This type of campaign script contain assumptive clauses with possible rebuttals. Connect with your potential customers. Learn how Callbox Multi-Channel Marketing Strategy can be of help. 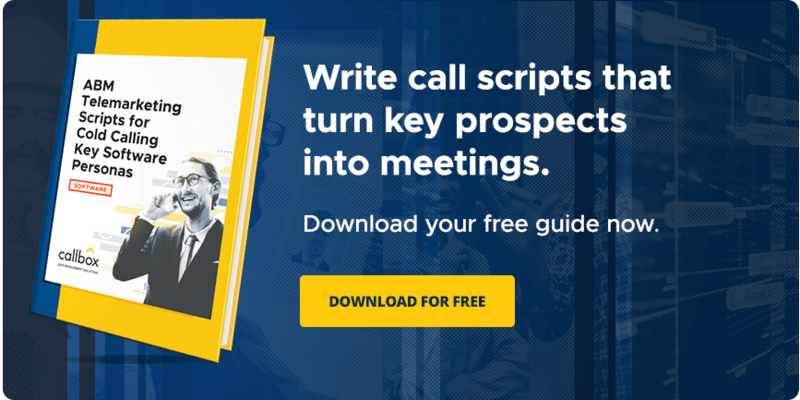 Take Away: A cold-calling script must clearly and effectively describe who you are, your company, the product you offer and how it will benefit the prospect and his business. Keywords and ideas should be highlighted, that would leave the essentials in the prospect’s subconscious, translating their desire and interest into verbal or gestured reaction. Callbox’s Multi-Channel Marketing Program and Marketing Automation Platform:... 5 Perky Blogs in the Payroll Industry: Which Content Strategy Stands Out?